Welcome to the first edition of the new monthly ‘Flowers In Pots’ series. I’m very excited to be working with Rona Wheeldon of Flowerona, a blog inspired by flowers, to bring you quick, easy, cheap and accessible ways to brighten up your home (inside and outside) with flowers in pots. Although the spring bulbs are starting to appear at this time of year, and the new buds and shoots will soon be emerging, the weather probably won’t be good enough to allow you to be out in the garden very much (unless you’re busy tidying up after the winter months of course!). Most of us have furniture of some shape or form in the garden, so why not bring a bit of colour to the scene by planting up a small pot of primulas for your table? Not only will it brighten up the view from March to May, but it’ll also supply a focal point that, whatever the weather, makes you want to go and sit out in your garden. Soak each pot of primulas in the bucket of water by submerging the whole pot until the water spills over the top and on to the soil. Try not to get the leaves and flowers too wet, if you can. When the air bubbles stop coming out of the soil, take the pots out of the bucket and leave them to drain. Now put a few handfuls of compost into the terracotta pot, until it’s roughly half full. 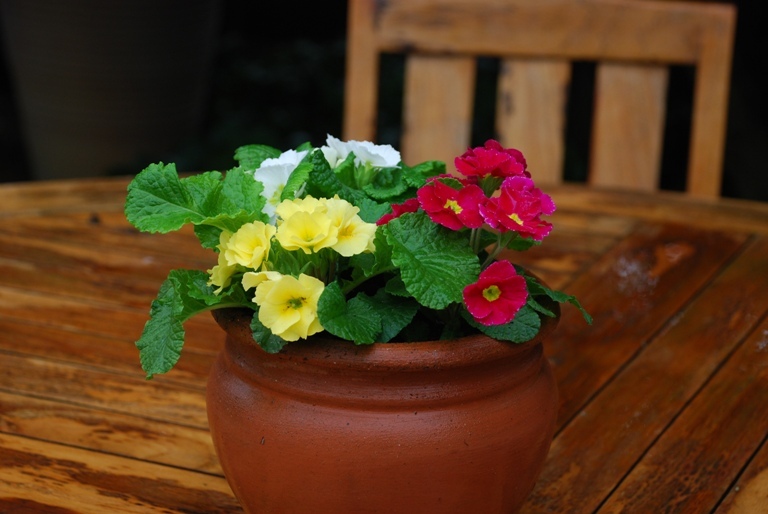 Gently remove the pots from the primula plants and arrange them in the terracotta pot. Fill in any gaps around the plants with some more compost, pressing lightly to ensure that they have soil all around them. Water well using the watering can. Use a rose on the end of the nozzle so that you can control the water flow. Allow to drain and place in your desired position – et voila! Primulas will also work well in a pot on the kitchen windowsill or other cool-ish place indoors. When they have finished flowering, you can transplant them into your garden where you can enjoy them the following year.